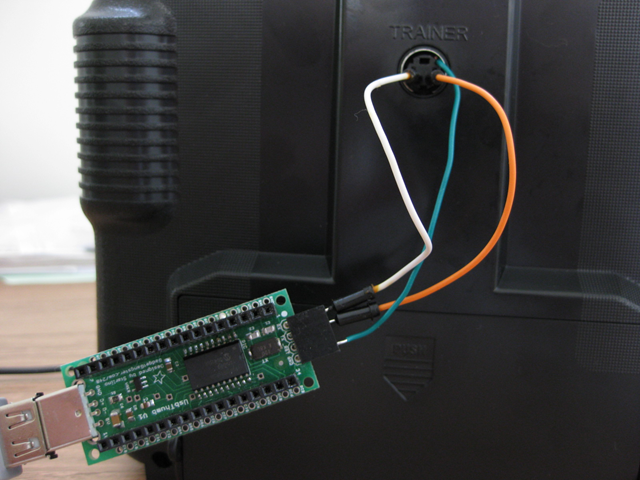 If you own a low-end RC transmitter with the Trainer port, you can program it using USBThumb (using the default USBThumbSerial firmware https://code.google.com/p/usbthumb/). The pin-out for the Trainer port is as follows, note the green wire (ground) is connected to the outer metal ring of the connector. Please note that this is not guaranteed to work with all transmitters, but if you own an UsbThumb you can use it this way. I also use UsbThumb to program Propeller chips (see http://www.starlino.com/usbthumb_propeller_programmer.html). matej on How much power is needed to hover ? Mak on A Guide To using IMU (Accelerometer and Gyroscope Devices) in Embedded Applications. jhmrsk on FTDI chip real of fake ? How to spot a fake RT232R / RT232RL and others ?